I don’t think I’ve ever been so excited to “copycat” a recipe before. Guys, I wait alllllll year (okay, at least a couple of months a year) anxiously awaiting the arrival of the plethora of pumpkin-flavored items at Trader Joe’s. I know, it’s so cliché, but it’s true. And to be honest, I usually don’t BUY a lot of said pumpkin-flavored items, I more so use them for inspiration of what fun pumpkin dishes I can make in the months of September/October/November. But, I fully and willingly give in to their pumpkin cream cheese that graces the dairy case for those few glorious months. Because it is sooooo good. Well, now I don’t have to wait around anymore (and neither do you!) 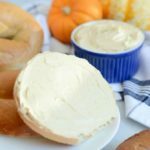 because I’ve figured out how to (almost) perfectly duplicate this favorite little indulgence of mine – enter, this Copycat Trader Joe’s Pumpkin Cream Cheese. Prepare for your life to be forever changed. The other great news is that this recipe is SUPER easy, and has very few ingredients, most of which you’ll already have on hand if you have a well-stocked pantry. We’re talking canned pumpkin puree (which, if you’re anything like me, you buy at least two cans of every time you go to the store during this time of year), cinnamon, brown sugar and sugar. And of course we can’t forget the cream cheese! So, since our Copycat Trader Joe’s Pumpkin Cream Cheese is THAT simple, let’s talk life for a second. How’s everyone’s week been so far? Mine has been HOT. We’re talking temperatures easily well over 100 degrees here in Santa Barbara, which is unheard of. Thank goodness we don’t have any humidity here (and we have A/C in our house!) otherwise I would absolutely be dying. On Monday I went and met one of my Napa friends in San Luis Obispo for some beginning-of-the-week wine tasting (because how else should we be spending a Monday?) and we thought we had made a smart decision going to more coastal wine country as opposed to Paso Robles. Boy, were we wrong. Yes, it was probably still hotter in Paso than is was in the Edna Valley, but we still ran into the triple digit temps! So crazy. I really hope this Indian Summer ends soon…I’m ready for sweater weather! It is supposed to cool down this week, which I’m REALLY looking forward to as I head out on a five day road trip up and down the length of California. The month of October is a crazy one for me travel-wise, and I kick it all off tomorrow as I head down to Long Beach to visit with my cousin/bestie/MOH (who is flying in from Hawaii.) Then, on Saturday, I drop her off at the airport and will be making my way up the coast to Santa Cruz to spend some QT with my parents, then on to San Francisco on Sunday for one of my bridesmaid’s own Bridal Shower! Talk to me once we hit November, but I’m actually really excited for all of these fun travels coming up. It’s one of the reasons I was motivated and excited to work for myself and be my own boss…Because I can make my own schedule. I can do most of my work on the road (just give me my laptop, camera, WiFi and occasionally a kitchen and I am good to go!) and I’m fully taking advantage of it these next few months. So exciting! Okay, well let’s get back to the real reason we’re here today, which is this Copycat Trader Joe’s Pumpkin Cream Cheese. As I mentioned earlier, there’s not too much to say because it is THAT easy. 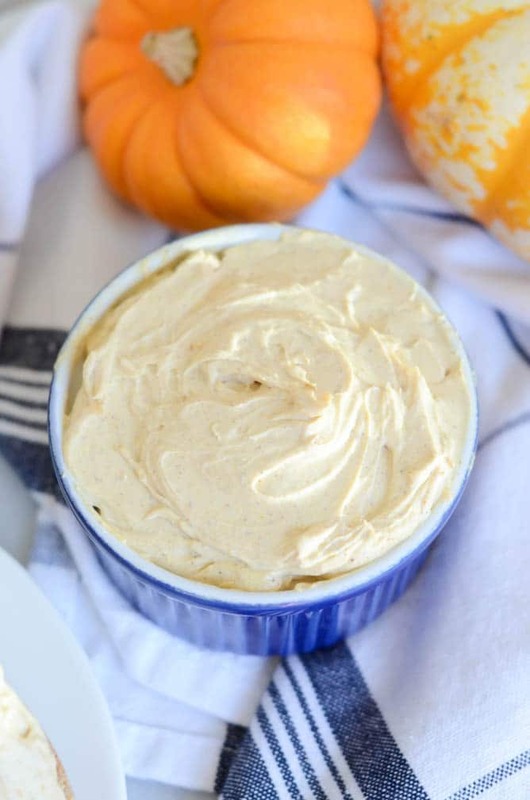 You grab a block of slightly softened cream cheese (I used light cream cheese to make it just a tad bit healthier, but you can use regular cream cheese as well), add the pumpkin puree, cinnamon, brown sugar and regular sugar, and use a hand mixer (or stand mixer) to beat it all together. That’s it! 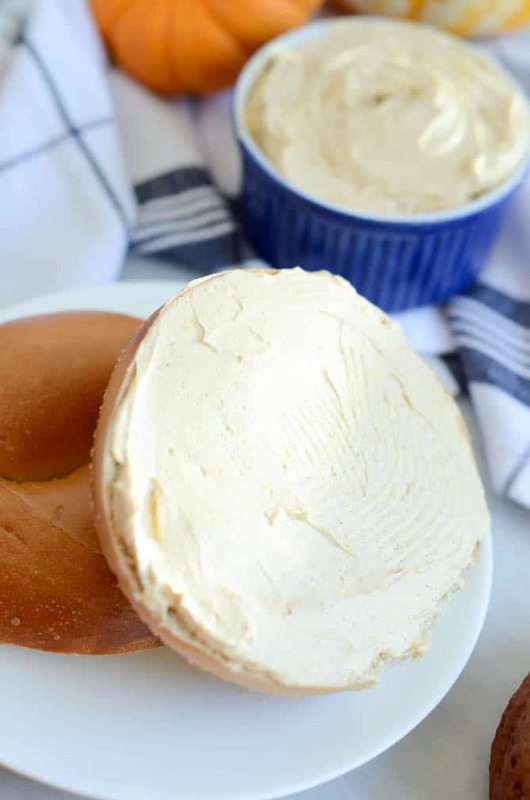 You can devour this Copycat Trader Joe’s Pumpkin Cream Cheese the OG way – shmeared all over a bagel, or I might also suggest dipping in some honey graham crackers or spreading it over a delicious slice of crusty multigrain bread. Incredibly easy, very few ingredients, and ready in just about five minutes. 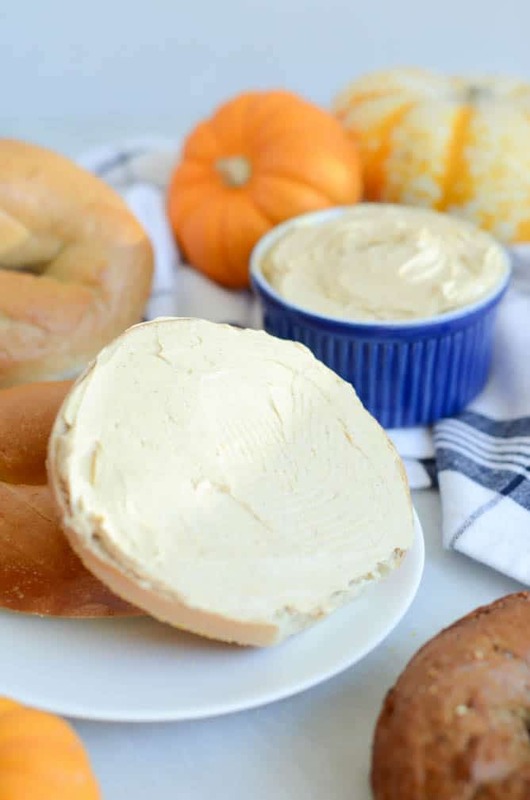 Can you really go wrong with this Copycat Trader Joe’s Pumpkin Cream Cheese? I think not. 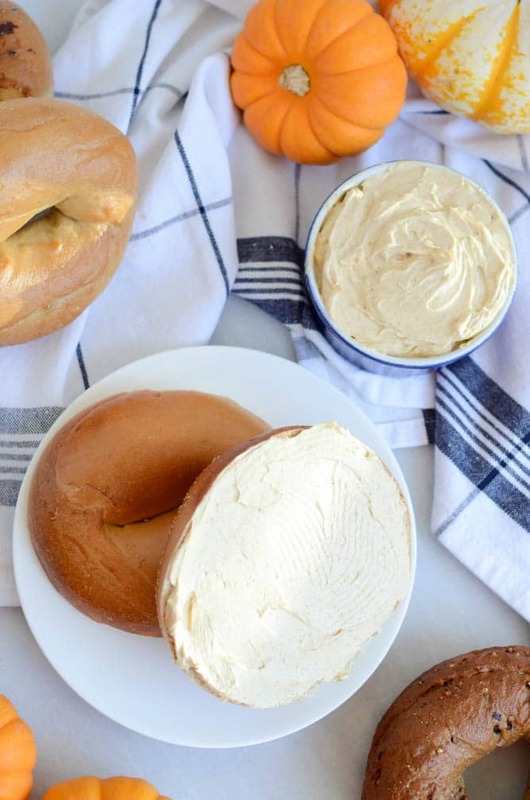 A festive fall take on cream cheese with pumpkin and spices. Place softened cream cheese in a small mixing bowl. Add pumpkin puree, cinnamon and both sugars. Using a hand mixer, mix to combine. Refrigerate until ready to serve. Serve on bagels, toast, or with honey graham crackers.